Holy frell, that's so drad, it's fahrbot! Constantly chasing this gang of intergalactic reprobates are the Peacekeepers, an ironically named military force that rules this galaxy with an iron fist. Moya’s crew is initially made up of Pa'u Zotoh Zhaan (Virginia Hey), a beautiful, blue-skinned, priestess; Ka D'Argo (Anthony Simcoe), a Klingon-like warrior; Dominar Rygel XVI (Jonathan Hardy), a quirky little alien motivated by wealth; and Aeryn Sun (Claudia Black), a former Peacekeeper officer who is now on the run. The spacecraft Moya itself was once captured by the Peacekeepers and is flown by Pilot (Lani John Tupu), who is symbiotically connected to the vessel. The series was filmed in Sydney and features a largely Australian cast. However, many of the characters, including Pilot and Rygel, were complex puppets that enabled more weird and wonderful aliens of different shapes and sizes to be used in the show. The series was canceled by what was then the Sci Fi Channel (now Syfy) after just four seasons, even though the story arc had been written to cover five. Fans launched a campaign to save the program and hoped a fifth and final season could be made. Their activism convinced the channel to produce a "The Peacekeeper Wars" miniseries to cap off the show's run. Browder and Black (who starred in the science fiction film "Pitch Black") both went on to appear in the last few seasons of "Stargate SG1" and even parodied their "Farscape" characters in the show's epic "200" episode (S10, E06). 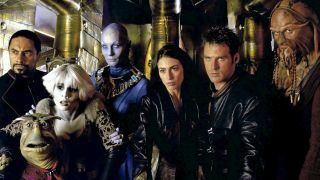 James Gunn, director of "Guardians of the Galaxy" and its sequel, "Guardians of the Galaxy Vol.2," was asked on Twitter in 2016 if he'd ever seen "Farscape," as its characters resembled those of "Guardians." He replied that, of all television shows, "Farscape" was the one that most influenced "Guardians of the Galaxy." Browder even makes a cameo in "Vol. 2" as the Admiral with Ayesha, Golden High Priestess of the Sovereign.